In this post, I walk through some key indicators of health in a crypto network to demonstrate why Bitcoin and Ether may be oversold, relative to their network fundamentals. Folks myopically analyse price movements (and price movements alone) as if they were the only factor determining a network’s health. This couldn’t be further from the truth. Look at Ripple’s token XRP’s market capitalisation relative to its node distribution, or at Ethereum Classic’s recent 51% attack. This is not to discount price as an indicator, but to view it as a relative indicator, not an absolute one. But even if you bought recently, don’t be alarmed. There is an indication of overselling relative to fundamentals. 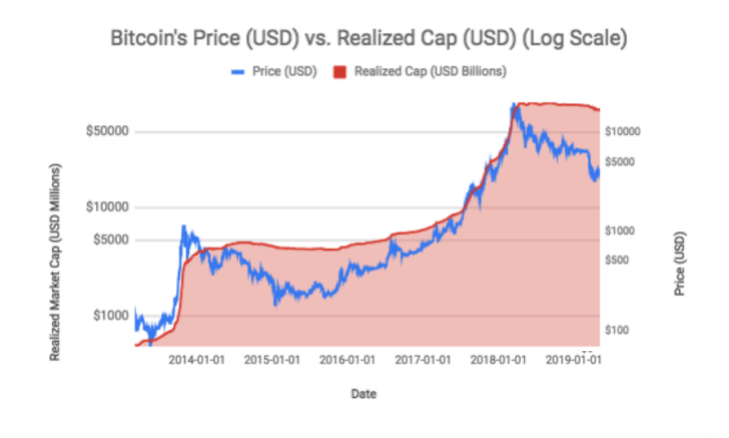 Similarly, the next graph looks at Bitcoin’s Price vs. the Realized Cap. Realized market capitalization is a novel economic metric designed by Coin Metrics, a leading crypto data site. Because large fractions of cryptocurrencies tend to get lost or go unclaimed, a measure is needed that weighs coins according to their actual presence in the Bitcoin economy. This is what Realized Cap does. On the supply-side, the price of Bitcoin and Ether has fallen below the hash-rate for both proof of work networks. A higher hash rate is better when mining as it increases your opportunity of finding the next block and receiving the reward, and in turn secures the network. It reflects more people contributing more real world resources to each network. Another supply-side indicator is that of developer talent. More work is needed to gather accurate data, but anecdotal evidence suggests that Ethereum is winning the battle over its major current rival EOS. Likewise, Bitcoin’s developer pool is similarly impressive, particularly in regards to the off-chain scaling solution Lightening Network. Looking at their respective GitHub contributions one way of doing this, but again, more work needs to be done in this area to draw any conclusions. Hash-rate in both Bitcoin and Ethereum are down substantially less than their respective prices. Zooming out two years, both Bitcoin and Ether are some of the best-performing assets, with a return of 3.88x and 10.80x respectively. The developer pool of Bitcoin and Ethereum could be a moat that cannot be easily replicated, although more data gathering is needed here. Valuation frameworks for crypto networks remain an inchoate and nascent activity. We have a long way to go. In most asset classes, there are agreed upon models, and only the models’ inputs are debated. In crypto, we are still trying to work out the models themselves. However, relative to network fundamentals, Bitcoin and Ether look cheap.